When 13 bald eagles were found dead in Maryland in late February, it was unclear what did them in. Now, wildlife officials have put at least part of the mystery to rest in determining that the birds did not die naturally. After performing necropsies on the dead birds, the U.S. 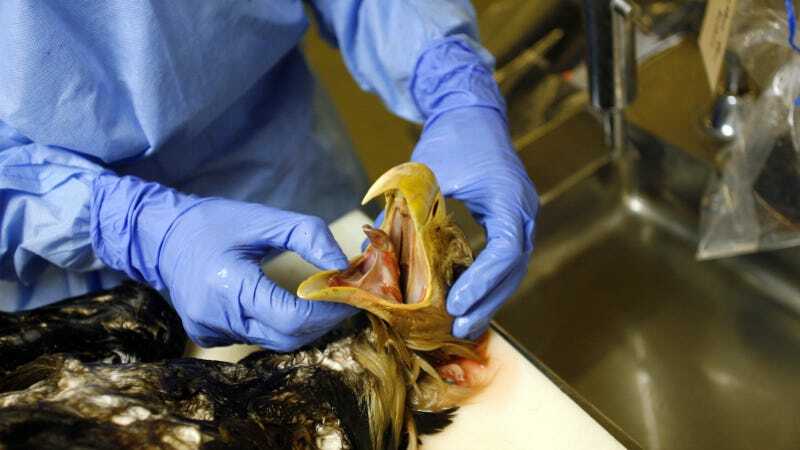 Fish and Wildlife Service (USFWS) said the results indicated that the eagles had not succumbed to disease, such as avian influenza, or some other natural cause. The birds, which were found on February 20 in Maryland's Eastern Shore, also did not show any outward signs of trauma. According to the USFWS the "investigation is now focused on human causes and bringing to justice the person(s) responsible for the death of these eagles." The agency is offering a $25,000 reward for information leading to the arrest and conviction of suspected wildlife offenders. Neil Mendelsohn, assistant special agent in charge for the USFWS’s north-east region, said this is the worst eagle kill he's ever seen. Aside from being America's national symbol, bald eagles are also a symbol of the success of the Endangered Species Act. Having once ranged across North America, bald eagles were nearly wiped out by the middle of the 20th century due to illegal shooting, habitat destruction, and pollution to food sources through pesticides like DDT. When initially adopted as the national symbol in 1782 there were as many as 100,000 nesting eagles. By 1963, there were fewer than 500. Through a concerted conservation movement that grew alongside the modern environmental movement in America, bald eagles found the protections they needed to start to recover, and in 2007 they were removed from the endangered species list. However, they are still protected under the Migratory Bird Treaty Act and the Bald and Golden Eagle Protection Act—both laws prohibit killing, selling or otherwise harming eagles, their nests, or eggs. The maximum fine for harming a bald eagle is $100,000 and up to one year in prison. For those in need of some redemptive news, humans have set up a live webcam in Washington that is expected to soon witness the birth of some new bald eagles. The parents, who have been nesting in a tree at the U.S. National Arboretum since 2014, are appropriately named “Mr. President” and “The First Lady”.